Everyone who enters the healthcare world knows how abbreviations can be the bane to your existence. You spend an inordinate amount of time searching Wiki and google trying to find what appear to be random letters strung together. At one point I was using a law firms site (god forbid) to help me with abbreviations. After a few short weeks you get the hang of the abbreviations and those random letters become second nature. MedAbbreviations would have definitely made my life easier during that initial period. Plus, I wouldn’t have felt dirty from using a law firms catalog for medical abbreviations. In this post I’ll review MedAbbreviations (v1.2) and mention some of the other medical abbreviation apps for the iPhone and the iPod Touch. 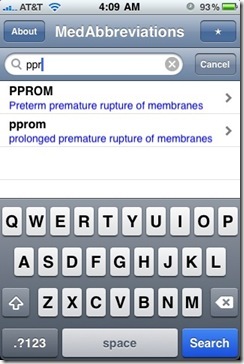 MedAbbreviations, an application with over 13,000 medical abbreviations, just dropped in price. It was $0.99, and now the developer is saying it’s “free for a limited time”. The other similar app in this same category, with essentially the same name, is Medical Abbreviations, currently going at $0.99 in the App Store. Both applications claim to have approximately the same number of abbreviations available and link to Wikipedia and Google. Medical Abbreviations offers some additions features, such as linking you to the mobile version of wikipedia(instead of the normal html page) and giving you related terms. MedAbbreviations has all the main abbreviations you need and more. It allows you to seamlessly search through the abbreviations and bookmark at the same time. The User Interface is definitely a bit rough and could be more aesthetically pleasing. MedAbbreviations does have some issues (refer to picture). It’s link to Wikipedia and Google does not currently work. 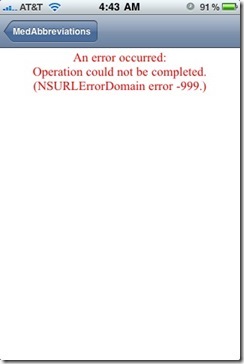 From what developers have told me, this is a problem related to Wiki’s new use of a different mobile subdomain. Also, MedAbbreviations can’t be found on it’s own developers site, so my assumption is that updates might not be coming. 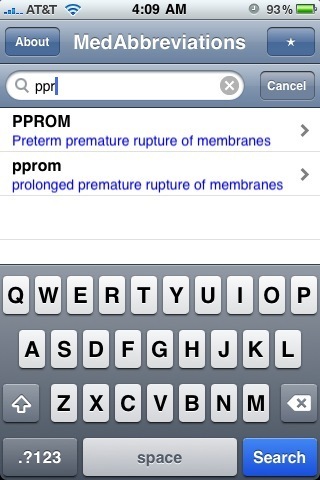 Needless to say, it’s free, and a dollar cheaper than it’s rival app, Medical Abbreviations. It gets the job done, and if you really need to use Wiki, there are plenty of free Wiki apps in the App Store, I prefer Wikipanion. My suggestions is that you try MedAbbreviations. If you find yourself craving a more polished App with a better User Interface, and the ability to link Wikipedia and Google properly, then get the Medical Abbreviations app instead.